We also expressed our solidarity with “Stansted 15”, 15 activists facing serious charges for stopping an illegal deportation in Stansted Airport, in March 2017. That is what the anti-terrorist laws are for, not to protect us but to stifle dissent. Despite the heavy rain, lots of people started gathering outside Lime Street Station at 3.30pm with banners, flags and music -courtesy of the comrades operating the sound system. There were some speeches about the situation of the “Stansted 15” and testimonies of people who have been directly affected by the ‘hostile environment’ in the UK. After the speeches, we started marching towards the Home Office. On our way, we walked across Liverpool One, chanting slogans against detentions, deportations and in support of refugees and migrants. As it is usual in Liverpool, we had a very warm reception by the public. We ended up outside the Home Office, a cold and intimidating building (brutalist style) where the UK Borders bureaucracy fabricates decisions on so many peoples’ lives. Once there, after some words by a Liverpool Migrant Solidarity Network comrade, the protest was called off. 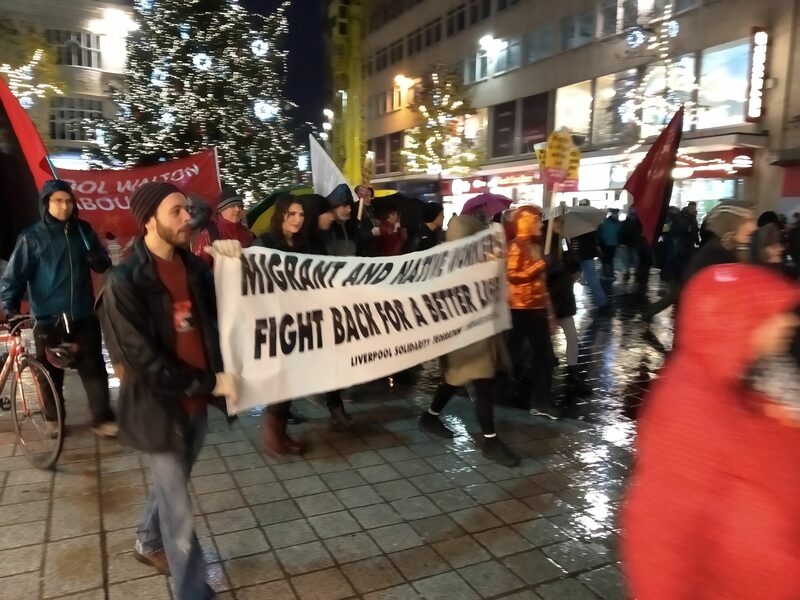 From Liverpool-SolFed, a union of migrant and native workers, we called out to all the working class to stand against Detention Centers and all the abuses and criminalisation that migrants suffer. Open the borders, close Detention Centers!